The sea of big-screen TVs at the electronics store may still be tuned to football games and NASCAR races, but smart marketers are learning that testosterone doesn't necessarily control the purse strings. But electronics stores have been slow to catch on. Nearly 75 percent of women surveyed by the industry group complained about being ignored, patronized or offended by sales people when shopping for electronics. Forty percent of the women said they were treated better when accompanied by a man. And more than half said advertisements for electronics were confusing — though half the men surveyed felt the same way. A meager one percent of women surveyed thought manufacturers had them in mind when creating products, according to the report, released at last week's Consumer Electronics Show. A growing number of companies are starting to target their wares toward female buyers, or at the very least peddle them in a more gender-neutral fashion. Sharp designed its flat-panel TVs two years ago with women in mind. It called the product line AQUOS to connote fluidity and a softer touch. It expanded its TV ads beyond sports and prime-time slots to Lifetime, the Food Network and The Learning Channel. 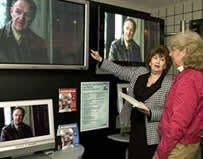 Last Mother's Day, a Circuit City ad prominently featured one of the sleek TVs in a kitchen. "When it came to consumer electronics, we noticed that the female population was being ignored a bit," said Bob Scaglione, Sharp's vice president of Marketing. Today, Sharp claims more than 50 percent of the LCD flat-panel TV market. Retailers who get this picture are seeing dividends. Tri-City Electronics, Inc., a high-end audio-video store in Conover, N.C., installed a children's area, replaced the utilitarian atmosphere with a homier layout and burgundy paint, and even offered tours of the store owner's home, complete with dirty dishes in the sink, to show the products in a real-life setting. Revenues have been climbing since, said co-owner Sibyle Hager. Brenda Myers, who bought a $5,000 plasma TV at Tri-City, entered the store angry at the unequal treatment she felt when she shopped for a new set last year at national electronics retail stores. "I was ticked off," said Myers, a retired customer service manager of a fiber-optics cable maker. "Every time you go to these places, they think women don't know anything, and they don't tell you the same features as they would when my husband goes with me." Even worse, she added, "some of them talk to your husband even though you're standing right there, too." The evolution of technology is behind the trend. Computers are now common household items, and the digital lifestyle — from doing e-mails to picture taking — is no longer the sole realm of early adopters, who once were predominantly male. Now, almost 33 percent of women consider themselves early adopters willing to buy cutting-edge consumer technology, according to the CEA study. Sony's products targeting women include its LIV line, sold exclusively at Target stores, which includes CD players for the kitchen and shower radios in colors from stainless steel to lime. The smaller designs should fit better in a home — characteristics desired by consumers in general and women in particular, said Ellen Glassman, a director of design at Sony.